When I talk about innovation I usually start with an explanation of why innovation is important. To do this I use two reports, one published in 2000 by PWC, the other published in 2010 by DeBooz. Although the surveys were published 10 years apart they provide a remarkably consistent view of why we should innovate. PWC and DeBooz both analysed over a thousand companies. They calculated how innovative the companies were by measuring things like the number of new product launches in the last five years, whether the products were genuinely new to market (not line extensions or adaptive innovations) and whether consumers considered the company to be innovative. PWC and DeBooz also analysed the financial performance of the companies: revenue, profits, shareholder value etc. The findings, in 2000 and 2010, were remarkably similar. I call them the 20:20:20 rule. The most innovative companies have greater income, are more profitable and generate more value for their investors. I don’t believe this is restricted to the corporate sector. In the public and not-for profit sectors the more innovative the organisation, the more value it delivers to it’s supporters or beneficiaries. Let’s go forward two years to 2012 and a survey of UK industry investment in innovation by NESTA (National Endowment for Science, Technology and Arts). 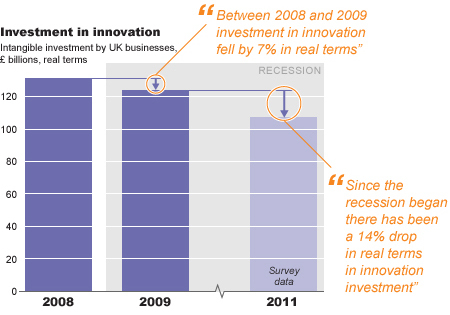 This revealed that UK industry has invested £ 24 Bn less in innovation since 2009. That’s a 14 % reduction. NESTA say this decrease in investment occurred immediately after the financial crisis and continued as the UK economy appeared to stabilise. While it feels counter intuitive to many people, the best way to drive growth is to continue to invest in innovation. It takes courage to do this in hard economic times. The 20:20:20 rule shows us why we need to find that courage. Note: Yes, the 20:20:20 rule is a simplification of the research. The De Booz work says that the top 30% of companies for innovation have 22% greater profit margins and 18% greater shareholder value than the rest. The PWC data shows, for example, that the top 16% of companies for innovation will double their market capitalisation over a 5 year period. So, the research shows that that the top 20% of innovation have at least 20% greater profit margins and 20% greater shareholder value. I’ve simplified the research to the ’20:20:20 Rule’ to make it easier to remember whenever I need to persuade someone of the value of innovation. This entry was posted in Creativity, Innovation and tagged analyse, business, enterprise, innovation, investment; profit, productivity. Bookmark the permalink. I mean take for example something like NASA. Something rather unconventional. Does the rule still apply?